Giant Angora is a relatively new breed, yet it's history is already being forgotten. Research through Angora News, Domestic Rabbits, and correspondence, has yielded the following history of the breed. In the early 1980's, several Angora breeders in the U.S. and Canada, began importing Angora rabbits from different areas of Germany. The Angora News (newsletter of the National Angora Rabbit Breeders Club), in 1984 & 1985, ran ads for German Angoras, by Leslie Samson, Erica Lynne, Louise Walsh, Geri Couchman, Sunny Bixby, Shirley Braverman, and Liselotte Lenhart. There was also an article on Germans by Candace Carter from Ontario. These were some of the early breeders of German imports. In the September 1985 edition of Angora News, appeared an article written by Louise Walsh, of Massachusetts, and her proposed Standard for "Commercial Angora (German Type)", which she would be presenting to the American Rabbit Breeders Association (ARBA) Standards Committee that year. The "type" section of the standard was accidentally omitted in the newsletter, so the complete standard was printed in the next issue (Dec. 1985). Louise had purchased her first stock from Dr. Eric Zimmerman, of Germany, and soon imported from several other German breeders. Louise "blended" her various German bloodlines. These descendants of German imports, were called "Commercial (German Type)" for their first ARBA presentation at the 1985 Convention in Houston, TX. Their volume of wool was truly amazing, and they passed the review of the ARBA Standards Committee. As per ARBA rules, the National Angora Rabbit Breeders Club (NARBC) was asked to vote, and did vote to support this new Angora breed. "The Commercial Angora was shown for it's official showing with some changes in the working Standard being asked for and agreed to before the presentation was examined. They showed uniformity, met the required weights, showed extra good length of wool as well as a tremendous amount of density. They seemed to carry a distinct type of wool with three separate hair shafts in the coat make-up. It was accepted for the first showing." "Perhaps you might be wondering why I introduced the German Angora as a Commercial Angora (German Type). In Germany, it is quite acceptable to show an 8 pound senior doe which should produce approximately 2.65 lbs. of wool per year. However, in order to express as much difference as possible (without altering the efficiency of the wool quality to body weight ratio) to the white English Angora, the senior weight minimum was increased to eight and one half pounds." The name was not left as "German", because if the breed was to be approved by ARBA, the Standard could not be like the Standard in Germany in weight, body type, and in other aspects. ARBA requires that each of their breeds be distinct from every other breed. The Standard from Germany was considered too close to the ARBA English breed Standard. Commercial Angora (German Type) failed their second presentation, during the Columbus Convention in 1986. "There are many different types of European Angoras being distributed here in the United States. The "German Angora" seems to be the popular term used for these imports or their offspring. We have a Standard for the Commercial Angora (German Type) which is the only standard these European and/or German animals can be shown under. There seems to be a wide discrepancy as to the size and abundance or lack of furnishings on these imports." "His research group visited several countries, and he says he feels the over 12 pound Angoras are too big to be profitable. Having all sorts of problems." "(member) was upset because I asked Louise Walsh to drop "German Type" from the Commercial Angora Standard. My reasoning was, there are several different strains of angoras in Germany, for us (members of the NARBC) to pick one strain and call it the German Angora, would be totally unjustified." Louise Walsh reported on the progress of the Commercial Angora during the National Angora Rabbit Breeders Club meeting at the ARBA Convention in Portland, OR, in 1987. She states, that since last Convention, "(German Type)" had been dropped from the name, and the senior minimum weights had been raised 1/2 pound. The breed passed their ARBA presentation for the second time (their third showing), during the Convention in Portland, OR, in 1987. On June 1, 1985, I asked the National Angora Rabbit Breeders Club if they wished to sponsor the Commercial Angora (German type). The animal this title represented was in actuality the German Angora in genetic background, phenotypically. The Club voted their approval. However, it is still a common misconception that the Standard which I first proposed was titled "German Angora". Not so.... I hope this background information may clear that up. Quite a few years ago, I became familiar with the German Angora, a rabbit I truly consider to be the world's best Angora fiber producing lagomorph. It was simple to fall in love with this easy mannered wool machine. I quickly pursued this gentle giant and from Germany I purchased as many German purebreds as pocketbook would allow. Once I had my foundation stock settled in, evaluated and producing offspring, I then approached The American Rabbit Breeders Standards Committee with the intention of introducing the German Angora Standard here in the U.S.A. There were some complications with the language of the German Standard, verbatim. I was told some revisions had to be made due to the similarities to the ARBA recognized English Angora (with the exception of the 3 fiber types). After much counsel and sought after advice from the ARBA Standards Committee, we came to an agreement. The name German Angora was replaced by "Commercial Angora (German Type)" and the emphasis placed on the wool producing capabilities for commercial purposes. The reference to German Angora was deleted. Therefore, The American Rabbit Breeders Association "Commercial Angora (German Type)" does not conform to the German Standard. In Houston, Texas in October 1985, the Standard and rabbit passed its first review by the ARBA as Commercial Angora (German Type). This year (1987), the ARBA Standards Committee, in its infinite wisdom, saw fit to make a suggestion that would end the confusion over the name this rabbit is known by. After the Standards Committee evaluated and passed this breed for its second review, they made a surprise suggestion that I might consider changing the name to Giant Angora. I agreed and also the Standards Committee of the National Angora Rabbit Breeders Club was in agreement and underwrote the decision. The most important feature this rabbit has, is its wool producing capabilities on an economic body type and a name change won't change that fact. So here goes - I started calling them Germans, changed to calling them Commercial Angora (German Type). I don't think I'll plead to being victimized by Alzheimer's Disease, but now I'm going to call them Giants! Thank you, Louise Walsh, Evergreen Enterprises"
Giants passed their third showing at the Madison, WI, Convention in 1988, and became an official ARBA recognized breed with the printing of their Standard in Domestic Rabbits magazine. The next year, 1989, a Giant Angora, owned by Donna Nimitz of MT, won Best 6-Class at the ARBA Convention in Tulsa, OK.
With the success of white Giant Angoras, it was only logical that colored Giants would follow. But in fact, there had been colors from the very beginning. "I only introduced white to the ARBA when I became the sponsor for this breed. But, naturally, the German people are fully as intelligent and competent as Americans. There are colored German Angoras. I just never chose to try to introduce colored rabbits to the ARBA. The only Angora wool of interest commercially (if you remember back a few years; you will note I first called them COMMERCIAL ANGORA, (GERMAN TYPE) is white. That which can be MILL DYED. The Giant Angora is a larger rabbit than the German Angora. During the developing years of the Giant Angora I mixed in COLORED short hair commercial bodied rabbits, French Lop and Flemish Giant. Not all white. So, there sure are colored Giant Angoras. They just haven't been introduced to the ARBA show table." "I'm not the ONLY one thinking about the benefits of owning colored Giants. Jeri Fisher of Montana has been working on red Giants for years. Louise Walsh has been developing not only coloreds but also LARGER Giants in many colors. 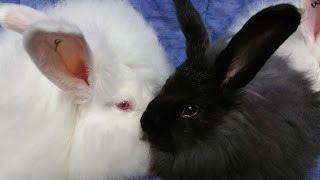 CARS (California Angora Rabbit Society) members Sherie Jorgenson and Jane Turner are also involved in the development of colored Giants and I'm sure there are many other breeders across the U.S. involved in this venture whom I've not yet met." Pat Duggan went on to present black Giants at the 1995 ARBA Convention in Louisville, KY, and at the 1996 Convention in Peoria, IL, being rejected by the ARBA Standards Committee both years. The presentation rights then passed to the next person holding a Certificate of Development, which was Jeri Fisher of Montana. Because of new ARBA rules, regarding a Certificate of Development, Jeri was not eligible to present colored Giants until the 1998 Convention in Portland, OR. Prior to that date, Jeri sold out her stock, and let the sponsorship go back to Pat Duggan, to begin again, with the 1999 ARBA Convention in Louisville, KY. The first ARBA approved working Standard for the Commercial Angora (German Type), (Domestic Rabbits, January-February, 1986) shows weights as: Senior Bucks - 8 months of age and over, or having attained minimum senior breed weight. Weight 8 to 10-1/2 pounds. Ideal weight 9 pounds. Senior Does - 8 months of age and over, or having attained minimum senior breed weight. Weight 8-1/ 2 to 10-1/2 pounds. Ideal weight 9-1/2 pounds. Intermediate Bucks and Does - 6 to 8 months of age, or over 8 pounds. Not to be over 9 pounds. Junior Bucks and Does - Under 6 months of age. Not to be over 8 pounds. The Angora News, Winter 1988-1989, shows the Standard for the final acceptance of the Giant Angora. Weights are: Senior Bucks - 8 months of age and over, or having attained minimum senior breed weight. Weight 8-1/2 pounds and over. Senior Does - 8 months of age and over, or having attained minimum senior breed weight. Weight 9 pounds and over. Intermediate Bucks and Does - 6 to 8 months of age, or over 8 pounds. Not to be over 9 pounds. Junior Bucks and Does - Under 6 months of age. Not to be over 8 pounds. There was no change in weights for the 1991-1995 Standard. Notice that the ideal weights that were present for the Working Standard, were omitted for the Final Standard, and for the 1991-1995 Standard. Tex Thomas, ARBA Standards Committee member at that time, later explains: "By virtue of being designated a "Giant" breed, the ARBA Standards Committee at the time, and the breeder/sponsor, removed the ideal weight, simply because no giant breed had an ideal weight, as the desire of all giants was to attain as much size as possible." A letter from Dr. Terry Reed to Candy Haenszel, dated March 8, 1994, (regarding NARBC Standards Committee), states: "When the Giants were accepted, there was an agreement with the sponsor that the minimum weights would be raised 1/2 pound at the following standard. This never occurred." Evidently this was overlooked in the transition of committees. The weight raise did not happen as originally planned. This, and the fact that the Giant senior buck minimum weight was only 1/2 pound above the ARBA required minimum IDEAL weight to have an intermediate class, prompted action by ARBA. While revising the Giant Standard for 1996-2000, ARBA suggested a weight raise. The purpose was to show more of a weight difference between Giant and English breeds, as originally planned, and also to clearly define the breed as being eligible for an intermediate class. The National Angora Rabbit Breeders Club members voted on raising the senior weight, on a ballot in the Fall 1993, Angora News. The vote failed. A letter, rejecting the "new" Giant Standard as submitted, from the ARBA Standards Committee Chairman Thomas, to NARBC Chairman Haenszel, states: "There is a large problem caused by the Angora club rejection of the proposed weight increase. As you know, Giants have a 6-8 class. ARBA rules provide that only breeds specifying a minimum ideal senior weight of 9 pounds are allowed to have a 6-8 class. You have an 8-1/2 pound minimum for senior bucks and no ideal senior weight stated. To keep the 6-8 class in this breed, you are going to have to either specify a minimum ideal weight of 9 pounds or more, or raise your weight limits on seniors." NARBC Standards Committee report, by Chairman, Candy Haenszel, for the Spring 1994 Angora News, states that our "new" Giant Standard was rejected by the ARBA Standards Committee for several reasons. One is, not raising the senior weights. ARBA permitted the addition of ideal weights of 9-1/2 and 10 pounds to be added, and the Standard was approved. ARBA chose to honor the National Angora Rabbit Breeders Club's vote, and not raise the senior weights at that time. However, ARBA stipulated that a one pound raise in senior weights must be made for the next Standard revision (2001-2005). ARBA Standards Committee Chairman, Tex Thomas' report for Domestic Rabbits, September-October 1994, includes a synopsis of each of the breed standards and their status. "Giant Angora - Standard passed; Giant Angoras given until next standard to raise their minimum senior weights at least one pound." Minutes of the ARBA Board Mid-term meeting, in this same issue, states: "Chairperson Thomas recommended to the Board that, effective with the 2001-2005 Standard of Perfection, the Giant Angora breed be required to raise the minimum weight for seniors by one pound. It was moved by Coffelt, seconded by Sorrels, to approve this recommendation. Motion carried." Angora News, Winter 1994-1995 issue, Standards Committee Report, lists the major changes to the Giant Standard for 1996-2000. "Showroom Classes: Added ideal weights. Senior bucks - 9-1/2 pounds; senior does - 10 pounds. Intermediate and junior classes will be based solely on age, with no weight limit. ARBA is requiring a one-pound raise in the minimum weight for seniors for the 2001-2005 Standards. THAT IS SIX YEARS AWAY." Four years later, at the time of this writing (February, 1999), the results of a survey, of the majority of Giant Angora breeders, conducted by Pat Duggan, have just been revealed. The survey question was, "Are you in favor of this weight increase?". Respondents were also asked to give comments. The results of the survey showed 21 owners/ breeders voting "no", 4 voting "yes", and 5 with no response. It is hoped that these results and comments will have some effect on the ARBA Standards Committee and Board, in reconsidering their earlier ruling. And, as with all histories, this is not the end. First Official Working Standard, from Domestic Rabbits, January-February, 1986. SHOWROOM CLASSES & REGISTRATION WEIGHTS:Senior Bucks - 8 months of age and over, or having attained minimum senior breed weight. Weight 8 to 10-1/2 pounds. Ideal weight 9 poundsSenior Does - 8 months of age and over, or having attained minimum senior breed weight. Weight 8-1/2 to 10-1/2 pounds. Ideal weight 9 1/ 2 pounds.Intermediate Bucks and Does - 6 to 8 months of age, or over 8 pounds. Not to be over 9 pounds.Junior Bucks and Does - Under 6 months of age. Not to be over 8 pounds.Breed Wool Classes - White, with Ruby or Blue eyes. Judged on wool quality only.NOTE: All rabbits competing in wool class must be entered in regular class. GENERAL REMARKS: Always keep in mind that the Commercial (German Type) is a separate breed from the English, French, and Satin Angora. GENERAL TYPE:Body - Points 10. Flesh to be firm over a well-nourished body. Body to be a commercial type. Well-balanced throughout.Faults: Round short-coupled, cobby body.Head - Points 3. To be oval but not pear shaped or have a pointed muzzle. Should be broad across the forehead and slightly narrower at the muzzle, to balance with the size and shape of the animal. Set close to the body with head trimmings formed by forehead tufts and cheek furnishings. Head trimmings are to be noticeable. Head trimmings of the doe, in general, are not as heavy as the buck.Faults: Short, blocky head and lack of head furnishings.Ears - Points 2. Length of ears to be in proportion with head and body. Ideal length to be 4-1/2 inches. Ears to be well set on top of head, straight and carried erect. Ears to be well haired, tasseled and fringed.Faults: Wide V-shape spread ears. Ears too short for balance.Disqualifications: Complete lack of furnishings.Eyes - Points 2. To be bold and bright.Legs and Feet - Points 2. Legs to be medium size in bone and in proportion to the size of the body. Feet to have width and to be well-covered with wool to extend beyond the ends of the toes. Toenails to be white.Faults: Bare spots with no wool on legs.Disqualifications: Normal hair on the front and/or hind feet. Colored toenails in white animals.Tail - Points 1. To be straight and well-covered with wool to the extreme end. Length to be in proportion with the size of the body.Faults: matted wool or lack of wool on tail. WOOL:Goal - High wool production on an economic body type.Density - Points 25. The greatest possible density is desired. Density is preferred to be even all over the animal, including the back and belly. Density should be determined by feeling several places on the body, sides, rump and chest, as well as blowing into the wool. Length should not be mistaken for density.Faults: Webbed, matted or discolored wool.Texture - Points 20. The mixed wooly fleece contains three (3) hair types. (1) Underwool - Is to be prominent over the other two hair types. It is to be medium fine, soft with a gentle shine, and delicately waved. (2) The Awn Fluff - This is soft, wavy wool with a guard hair tip. Found between the underwool and the awn hair (guard hair). To be longer than the underwool, stronger waved ending in a fine awn-like tip. (3) The Awn Hair (Guard Hair) - A strong, straight hair to protrude above the fleece. To be present and evident and to be more predominant in does.Faults: Soft, cottony or packed wool.Disqualifications: Complete absence of wave to wool or excessively coarse coat due to the predominance of Awn Hair and Underwool.Length - Points 20. Length to be uniform over the body. Ideal length to be 4 inches. Minimum acceptable length to be 2 inches for showing and for registration. Evenness in growth of wool is important. That is, no break in the outline indicating thinness, broken or matted wool. Slight molt permissible at the nape of the neck and forward of the shoulders only.Faults: Wool that is not uniform in length. Wool that is listless, lifeless, soft, matted, packed or felted. Wool that is very thin, bare spots.Elimination: Wool under 2 inches in length. COLOR - Points 5. White and as even as possible. Carried well down the wool. The dense wool may appear ivory colored as compared to the face, ears and legs. This is not a fault; however, the goal is as pure white as possible. Eyes to be ruby or blue.Faults: Yellow cast or stained wool. Eyes that are pale in color or dull in color.Disqualifications: Any eye color other than ruby or blue. CONDITION - Points 10. per ARBA definition. Suggested Yarn; Fuzzy Vaughn’s Euphoria DK Angora Yarn, 50% Giant Angora/ 30% Merino/ 20% Silk, 9 WPI. Bunny Cable Using Circular Needle, working in the round. Cast on 66 Sts, this is a great number for the ribbing. Row 10 you will be making several increases, increasing to 90 Sts total. The increase in Sts will help with the natural shrinkage when you add in the cabled bunnies in the body of the hat, enabling your hat to fit great. Here’s a little math, if you are interested; Each pattern repeat is 15 Sts.I used 3 Sts(first 3 sts noted in each row) in between each Bunny, which is 12 Sts. Using 6 Repeats of 15 Sts, will equal 90 Sts. You can easily add more or less stitches in between each bunny pattern to adjust the size if necessary. F1, F2, F3, F4, Oh My! A few helpful hints deciphering the "F" Code. I have been dabbling in the color world in Giant Angoras. Due to the lack of abundant quality Colored Giant Angoras, I decided to attempt to make my own. This whole colored world is a great learning opportunity for me. As white Giants are REW (Red Eyed White). You bred REW to REW and get REW. Pretty simple, well at least the color identification is simple. As a rabbit breeder with intent and a focused plan, nothing is ever simple. This sparked several conversations regarding F1, F2, F3, vs Purebreds. I hope the following description helps when discussing the crossbreeds and/or Hybrids. Hybrid and/or Crossbreed is a Giant Angora that has rabbits of a different breed other than Giants showing in the 4 generation pedigree. Please don't get hung up on Hybrid vs Crossbreed. Just remember that both are not purebreds. F1 is a purebred Giant Angora crossed with a rabbit of a different breed. Pssssst, you hear about Sinfully Soft? Have you heard what's come'n? Polar White, Champaign (light fawn), Petrichor (dark grey), and a surprising new yarn... Kissed by Silk!